Siri is also opening up to third-party developers. After pushing Siri hard with iOS 9, Apple aims to improve 3D Touch with iOS 10. Announced at WWDC today, the latest version of Apple's mobile OS will let you use 3D Touch on your lock screen, the Control Center and even in third-party apps like Uber. Additionally, Apple is finally opening up Siri to third-party developers, which should hopefully make it a more useful virtual assistant. As usual, it'll arrive in the fall around the time the new iPhones come out. While 3D Touch was a nifty addition to iOS 9 with the iPhone 6S, it seems genuinely useful in iOS 10. From your lock screen, you can press on the right side of the screen to unlock the camera quickly, or the left side to open up widgets (things like weather and recent news). And when it comes to third-party apps, you can use 3D Touch to do things like see live action from ESPN's app or track your car by pressing down on the Uber shortcut. At WWDC today, developers seemed particularly excited about being able to tap into Siri. 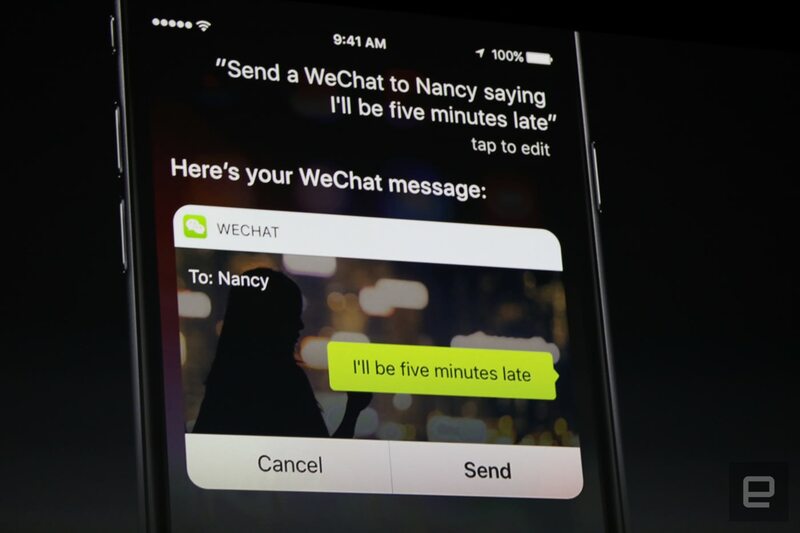 As one example onstage, Apple's software engineering head, Craig Federighi, showed off dictating a WeChat message using Siri. You can also have Siri call for cars with Uber and Lyft; search for photos in apps like Pinterest and Shutterfly; and control workouts from Runkeeper. Siri will even be able to send payments to others with voice commands. Siri will also bring its intelligence to iOS 10's keyboard, powering things like smart suggestions, scheduling with friends as well as multilingual typing. Basically, you'll see much more relevant QuickType suggestions appearing above the keyboard. And if you're chatting with a friend about getting dim sum at 11, Siri will be able to schedule that into your calendar pretty easily. As for other updates, the new iOS 10 Photos app will use "advanced computer vision" to power facial and object recognition. That'll allow it to automatically tag and categorize your photos, similar to Google Photos (the only difference is that Apple's version works locally). 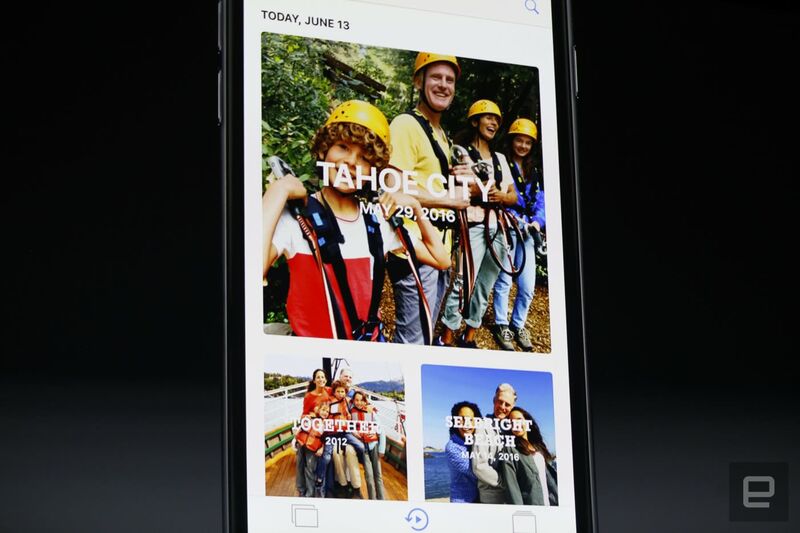 A new "Memories" feature groups together related photos to let you quickly relive your vacation experiences on the fly, complete with a variety of music mood choices and a map of where you've traveled. On the iOS 10 Maps front, Apple is aiming to be a lot more proactive. You can slide up from the bottom of the app to see suggestions of potential trips, which includes entries from your calendar. Turn-by-turn navigation is a lot more detailed, and it'll be able to take over your car's console if it's CarPlay ready. iOS 10 Maps is also opening up to developers, which will let you do things like book Uber cars and make OpenTable reservations without even leaving the app. 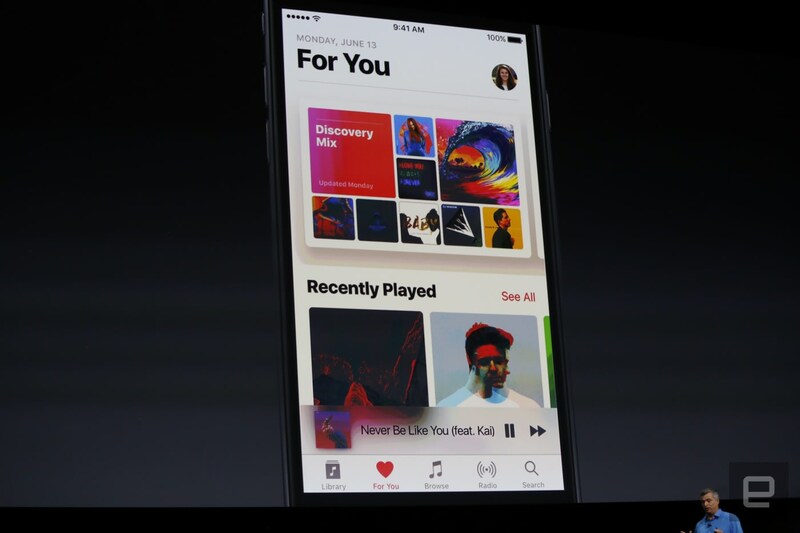 There's also a redesigned Apple Music app, which sports a face-lift and can help you find music you'd like more easily. You can also glimpse lyrics right below songs currently playing. The revamped Apple News app sports around 2,000 publications, and it finally supports built-in subscriptions and breaking news notifications. If you're paying for the Wall Street Journal, you'll be able to access stories without leaving the app (though I wonder how Apple's partners feel about users being led away from their own apps). On the HomeKit front, Apple has created a new app called "Home" that'll serve as your connected home hub. It'll also let you do things like watch your security camera feed right from the lock screen. While lots of companies have vowed to support HomeKit, the Home app will hopefully unify all those disparate smart home devices. Apple has also revamped the phone experience this time around. iOS 10 can transcribe your voicemails, so you don't have to waste time listening to messages. And, as seems to be the theme today, Apple is opening up its phone extensions to third parties. A call-security app from Tencent, for example, can tell you if an incoming call is potentially spam. 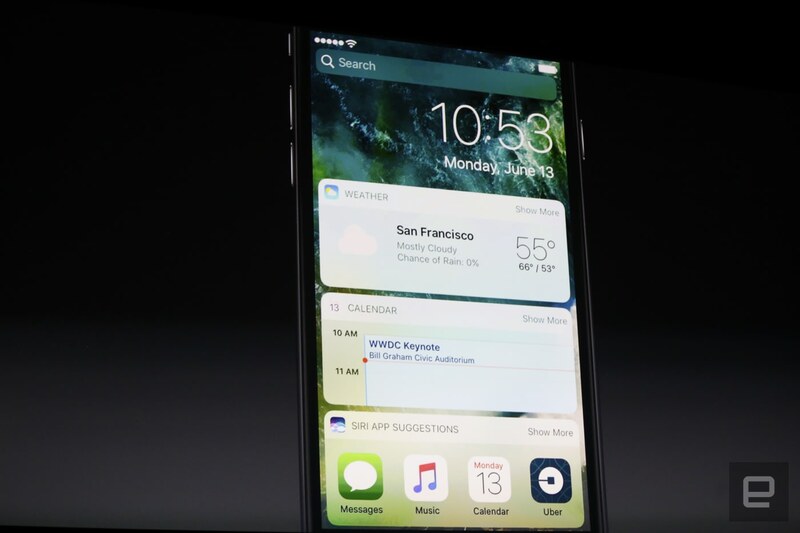 And VoIP apps will be able to have their calls show up on your recent calls list and lock screen. You'll also be able to add contacts from those apps to the iOS favorite contact section. Last, but certainly not least, are a slew of upgrades for the Messages app. Those include bigger emojis, the ability to find emojis based on text and special effects that take over your entire phone's screen. A new "invisible ink" feature will also obscure messages and photos, which adds a bit of allure (or potential danger if you've got pranksters among your contacts). "I'm not sure I want to open that," Federighi said when confronted with an obscured image during the demo. That's something all iOS users could end up feeling later this year. 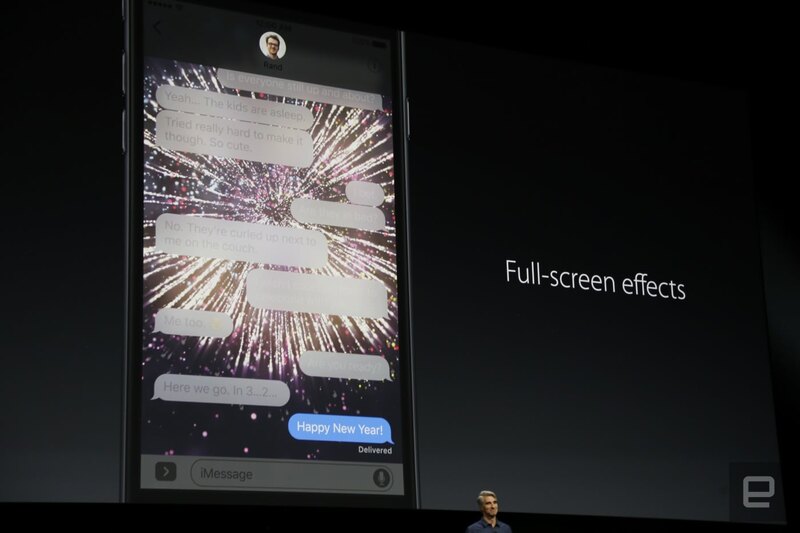 You'll also be able to send handwritten messages, as well as edited live photos, through the new Messages app. Apple is basically trying to make Messages a lot more fun -- hopefully so that people will use it instead of something like Snapchat. And yes, third-party apps will also be able to integrate much more easily with iOS 10's Messages app. Developers will be able to get their hands on iOS 10 today, and we hope to get some time with it soon. As a major new OS release, it seems a bit disappointing if you were expecting an entirely new look. But for Apple, a company known for not playing well with others, it's also a big step towards making iOS a lot more developer-friendly.